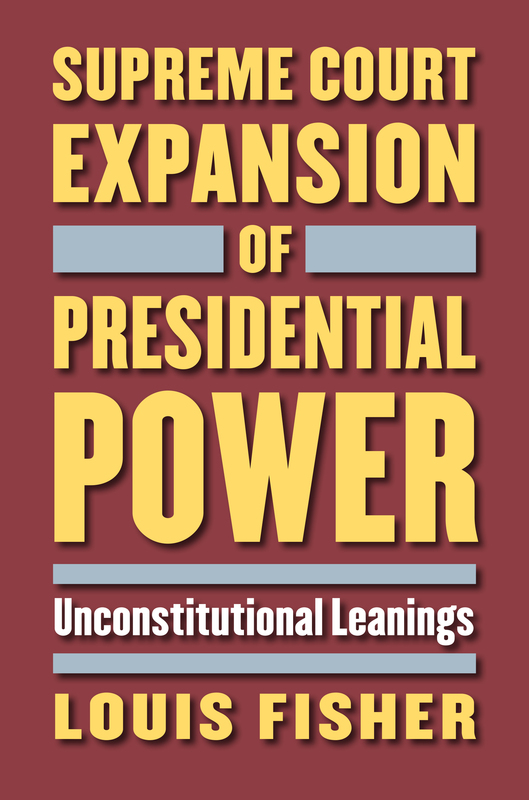 SUPREME COURT EXPANSION OF PRESIDENTIAL POWER: UNCONSTITUTIONAL LEANINGS, by Louis Fisher. Lawrence, Kansas: University Press of Kansas, 2017. 352pp. Cloth $39.95. ISBN: 978-0-7006-2467-6. Reviewed by Michael A. Zilis, Department of Political Science, University of Kentucky. Email: michael.zilis@uky.edu. This past spring, during oral argument in TRUMP V. HAWAII (2018), Justice Elena Kagan raised the hypothetical of an “out-of-the-box kind of President,” an avowed anti-Semite who bans immigration from Israel. What are the limits, Kagan asked, to the president’s immigration authority? Notably, the question appears to fly in the face of a modern Supreme Court that “regularly idealizes the President as specially equipped to act responsibly and competently in external affairs” (p. 309). This idea – that the Supreme Court has improperly ceded constitutional authority to the executive in foreign affairs – provides the central theme of Louis Fisher’s SUPREME COURT EXPANSION OF PRESIDENTIAL POWER: UNCONSTITUTIONAL LEANINGS. The book reviews the historical and legal record concerning executive power and Fisher covers a wide swath of territory. He devotes the initial chapters to analyzing separation of powers principles as well as precedents from the 18th and 19th centuries, arguing forcefully that the Framers intended for the executive and legislature to share power in the conduct of foreign affairs. Even Lincoln, who so aggressively used executive authority during the Civil War, recognized basic limitations. During THE PRIZE CASES (1863), his administration argued that the right to initiate a conflict belonged exclusively to Congress. But Fisher contends that, decades later, a fundamental shift occurred. Reviewing in detail the conduct of every administration since World War II, he finds presidents becoming more aggressive in their assertion of plenary foreign affairs power. He also expresses alarm about a Court that has become willing to accede. In each chapter, Fisher nicely blends a review of the historical record by examining the major actions of the executive branch with analysis of the most important case law. The heart of Fisher’s critique points to the Supreme Court’s careless use of dicta in its opinions, which has compounded presidential authority over time. The primary object of this sloppiness is UNITED STATES V. CURTISS-WRIGHT EXPORT CORPORATION (1936). The opinion made passing reference to the president as the “sole organ” of the country in international affairs and although it was not central to CURTISS-WRIGHT’s resolution, the sole-organ doctrine featured prominently in subsequent cases. The executive branch, Fisher argues, bears some responsibility for the Court’s overreliance on the doctrine, since presidents insistently cited the CURTISS-WRIGHT dicta time and again. But the justices also erred. By the end of the 20th century, the Supreme Court accepted the misguided proposition that CURTISS-WRIGHT established plenary executive power in foreign affairs, opening the door to a host of presidential misjudgments from Vietnam to the War on Terror. One of the book’s most interesting contributions concerns how legal errors and presidential misrepresentations shaped U.S. foreign affairs. The sole-organ doctrine provides the prime example. Not only did the Court come to accept dicta as a central legal precept, but the CURTISS-WRIGHT opinion itself misread a John Marshall speech that referenced the idea. Fisher argues that when the speech is read in its entirety, it becomes clear that Marshall did not believe the executive wields plenary foreign affairs power; rather, Marshall was defending the president’s ability to carry out a treaty provision. In other words, the president acts as the sole organ only for the purposes of [*43] implementation. The CURTISS-WRIGHT Court obscured this nuance. The original misreading, compounded by a judicial overreliance on it, led to grave consequences, such as Japanese interment during World War II and the flawed state secrets privilege in UNITED STATES V. REYNOLDS (1953). Most disturbingly, perhaps, Fisher shines the spotlight on the Nazi saboteur case EX PARTE QUIRIN (1942). The ruling, which the Court expedited, allowed for the execution of six accused Nazi spies whom the government put to death within a week. But then the Court was forced to convene to write an opinion that would justify the already-completed executions. Needless to say, this created substantial legal difficulties – there was essentially no going back on the per curium after the accused had been put to death. Ultimately, the QUIRIN Court failed to carefully interrogate whether the actions of Franklin Roosevelt’s administration complied with Congress’s war authorization, and multiple justices later expressed regret over how the Court handled the case. Fisher’s blending of the historical and constitutional record, impactful primary and secondary themes, lively writing, and ability to weave an interesting story make the book quite rich. As such, it should interest both political historians and constitutional law scholars alike. Fisher does not mince words and displays no hesitancy in making a convincing normative argument. This, of course, makes the work different from some law and politics research in political science, and scholars in this mold may appreciate more systematic discussion of case selection and outcomes as well as a fuller account of the justices as strategic actors. But Fisher’s aim is clear: to provide a comprehensive survey of the historical record, pointing out major developments along the way. His evidence is comprehensive and convincing, although some portions detour from the main argument. As an example, consider a chapter on the use of the legislative veto, which contends that both Congress and the executive branch ignored Supreme Court directives on the practice. While relevant to the separation of powers dynamic, these developments stand apart from the foreign affairs matters that animate most of the book. SUPREME COURT EXPANSION OF PRESIDENTIAL POWER is at its strongest when tightly focused on the cases that illustrate its central theme. The manuscript raises a number of interesting questions that merit further exploration. First, it is worth probing why the Supreme Court has neglected to police executive branch actions and why Congress has failed to more aggressively push back against the president. Part of the answer comes from the fact that all parties may find it advantageous to depart from a stronger power-sharing arrangement. The case of the legislative veto illustrates the point, since it provides the executive “the flexibility it desires and that Congress otherwise would not have provided, while allowing Congress to retain control” (p. 196). Deference to the executive in foreign affairs also serves such a purpose, allowing the administration to determine the conduct of military affairs, in which the Court does not feel equipped intervene. Viewed in this light, deference is less a constitutional abdication than a recognition of political reality by a savvy judiciary. Such arises a second question: how do the elements of judicial strategy play into the Supreme Court’s foreign affairs jurisprudence? In most of the cases Fisher reviews, the justices face pressures from the executive branch, Congress, public, and legal precedent. Often, the book shows, the Court misreads the latter out of deference to the former. Yet it is worth considering how often these rulings are a product not of a misguided Court but rather one seeking to balance a number of factors about which it cares. Recognizing this fact would not alter Fisher’s ultimate conclusion – that the Court has departed from the Framers’ vision of foreign affairs – but it would provide insight as to why it happened and the conditions under which we may expect it to continue. After all, deference is not inevitable. The book’s latter chapters show that the Court sometimes denies broad presidential claims of authority, as in HAMDI V. RUMSFELD (2004) and RASUL V. BUSH (2004). But recall that these rulings occurred just as the public was becoming much [*44] more skeptical about the Bush administration’s handling of foreign affairs (Jacobsen 2007), which may have provided a strategic Court reason to police the executive branch more carefully. In other words, deference may come about not from judicial abdication, but from justices who are carefully attuned to a host of competing considerations. This leads to a final important question regarding how the Court will read executive branch power going forward: will the justices continue to countenance plenary presidential power in foreign affairs in the near future? In spite of a long pattern of deference, there are subtle signs of change. Justice Kagan’s questioning, during oral argument, in TRUMP V. HAWAII (2018) echoes some of the skepticism regarding presidential conduct that the Supreme Court expressed in HAMDI and RASUL. Even more dramatically, the Court finally, in 2015, corrected its eight decade-long misreading of CURTISS-WRIGHT by limiting the scope of the sole-organ doctrine in ZIVOTOFSKY V. KERRY (2015). Yet Fisher is not optimistic that the ruling represents a new direction, noting even it has “many deficiencies” (p. 298), including a continued failure to analyze what John Marshall originally intended with his sole-organ speech and a persistent reliance on other erroneous dicta. Fisher’s answer to the preceding question, then, is not a hopeful one. That the current Court continues to err on the side of the president in foreign affairs should give pause to legal scholars and citizens alike. Jacobsen, Gary C. 2007. “The Public, the President, and the War in Iraq.” In THE POLARIZED PRESIDENCY OF GEORGE W. BUSH, edited by George C. Edwards III and Desmond S. King, 245-284. Oxford: Oxford University Press. THE PRIZE CASES, 67 U.S. 635 (1863). “TRUMP V. HAWAII.” Oyez. Accessed May 22, 2018. https://www.oyez.org/cases/2017/17-965. TRUMP V. HAWAII, 585 U.S. ____ (2018). UNITED STATES V. CURTISS-WRIGHT EXPORT CORPORATION, 299 U.S. 304 (1936). ZIVOTOFSKY V. KERRY, 576 U.S. ___ (2015). © Copyright 2018 by author, Michael A. Zilis.